eLogger can take many actions when important entries are made. It can trigger emails, internal notifications, color coding, and/or request acknowledgement from specific users. These alerts can be triggered by conditions you define, such as a reading exceeding a set value. Emails include a PDF report of the entire entry and a hyperlink back to eLogger. Specify your need for instant access to historical data. 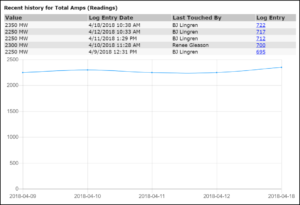 Easily trend the last five entries for any of the data you are tracking. Saved Search – Identify your favorite searches and make them easily accessible to you and anyone you choose to share them with. If you allow your users to edit logs, eLogger’s powerful audit feature tracks who changed it, what they changed, when they changed it, and what the previous value was. Create reminders to let employees know that an entry needs to be made on a specific date at a specific time. That time can be as frequent as every minute or as infrequent as once a year. Denote certain entries as mandatory so that users are prevented from making any other entries until they have made the entry that you have mandated. Log entries are neatly formatted on your screen, displaying only what you want to see, in the order you want to see it. Spell check and formatting (i.e. bold, underline, fonts, colors) are available. 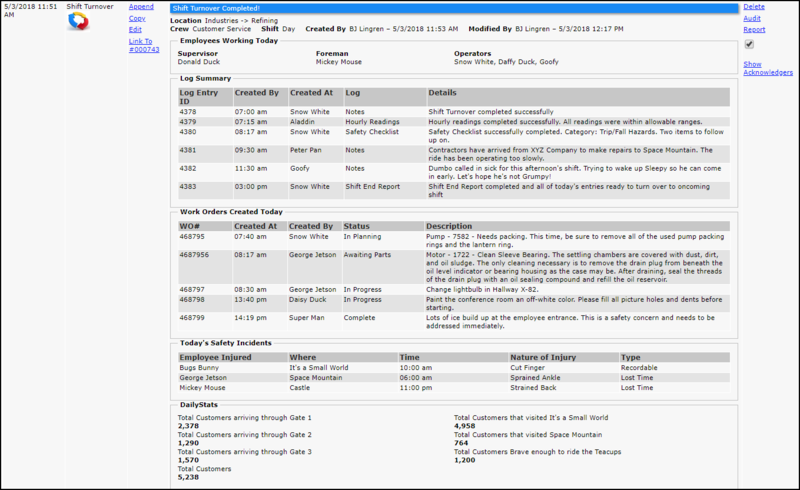 Log entries are neatly formatted on your screen, displaying only what you want to see. Users have the option of adding an unlimited number of documents, links and/or images to the Log entry. Easily keep your employees informed with system-wide announcements and site-specific notifications. eLogger prides itself on excellent U.S. based customer support. When you call support you will speak to a person, not a machine. Annual Maintenance includes unlimited customer support, unlimited administrator training that includes access to training videos, numerous interactive training sessions and one-on-one customized training, periodic upgrades, and annual product enhancements. 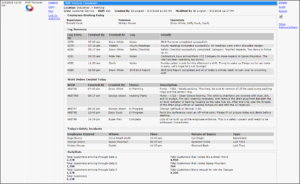 Combine multiple features to create more advanced tasks such as personnel and task scheduling.